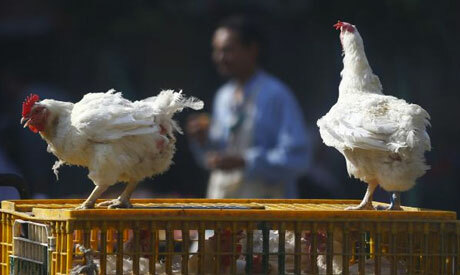 Two new cases of bird flu in Egypt have brought the total number of cases in the past year to 29, the health ministry said on Thursday. A six-year-old child from Giza governorate, one of the infected cases, suffered from fever and a cough, before being transferred to hospital. The laboratory's sample showed her condition was critical, according to the health ministry statement. The other case, a 45-year-old man from the Nile Delta city of Menoufiya, suffered from pneumonia, was referred to the intensive care unit and placed under the medical ventilator. On Wednesday, a woman in her late 30s died of bird flu. According to official figures, 11 people have died of bird flu infections nationwide in 2014, 12 have been treated and six are still receiving treatment. The health ministry reiterated its calls for people who handle poultry to seek immediate treatment once flu symptoms start to appear, while strictly advising them to cover their noses and mouths when they deal with any kind of domesticated birds. In Egypt, most cases of bird flu have been identified in rural areas, where villagers tend to raise poultry in their homes, increasing exposure to live or dead infected birds. Bird flu first appeared in Egypt in 2006.